Last night, Labour announced one of their keynote policies ahead of the 2017 General Election. A financial transaction tax on the City of London. Time for a blog to outline just what in the name of Jim it actually is and what it’s supposed to do. That’s the council elections done then. Well, that’s the voting done. The “fun” bit is going to happen over the next few days as the negotiations work out. Not one of the 32 councils in Scotland have a majority control with major Labour fiefdoms like Glasgow and North and South Lanarkshire all falling to that party’s continuing collapse. Not safe, though, were SNP councils like Dundee which has also slipped out of majority control. The rise of the Conservative and Unionists (who have been benefiting from the second half of their name even in spite of the first) has been remarkable even if all they’ve been doing is cannibalising the other Unionist parties rather than making any substantial gains on the other side of the constitutional divide. The Greens had a good time of the elections, increasing their seats from 14 to 19. 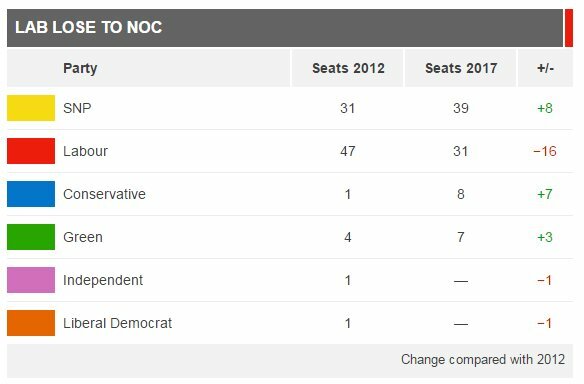 Incidentally, we’re now the largest party on Orkney Council (albeit because all the other councilors are independents). My own branch of South Lanarkshire failed to get any candidates elected although I have to give my personal thanks to the 139 people who placed their trust in me with their 1st preference votes. It was a great experience being a candidate. Who knows. It may not be my last time. As it stands now, South Lanarkshire will be represented by 27 SNP councilors, 21 Labour, 14 Conservatives, 1 Lib Dem and 1 Independent. With 33 required for a majority there will now be a weekend of intense negotiations over who goes where. Whilst they’ve lost their control, Labour will now be the kingmakers here. It will be their choice whether they side with a party with whom they share many or most of their values when it comes to local issues or whether they’ll side with a party with whom they share precisely one value over which their councilors will have precisely zero ability to effect. This will be the story going on in many more councils across Scotland and I cannot predict how they’ll turn out, only that if Labour does decide to ally itself with the Tories one more time for one more stint at short term gain then their final death as a party is inevitable. They will have thrown away their last reason to exist in Scottish politics. And they wouldn’t be missed by many, not even their “allies”, once that happens. Glasgow will be an interesting story in this regard. With the tally there being 39 SNP, 31 Labour, 8 Conservative and 7 Greens and with 43 needed for a majority there is no possibility of a Labour/Tory Alliance conspiring to keep control of this city. Instead it seems inevitable that the SNP will be the part of control here, it just remains to be seen if they’ll form a formal or informal coalition with Labour or with the Greens to get there. Obviously I’d certainly be hoping for the latter but, as with all in politics, I guess it’ll depend on the price asked by all sides involved. No matter what, Glasgow is ripe for exciting possibilities for change. Too many areas of the city have been neglected for too long and there are great opportunities and assets there just waiting for someone to have the courage to take on the challenge of exploring them. I’d personally like to see something like the Community Buyout scheme recently promoted by Common Weal given a shot. You can read about that here. “We haven’t commissioned to the best of my knowledge any independent research of our own. If committee wishes me to look at that, I will certainly consider that absolutely.” – Derek Mackay on the Government’s (lack of) analysis into the proposed ADT cut. Common Weal duly obliged and updated our previous work on the topic to account for the impact of Brexit. You can read the new report here or by clicking the image above. It’s just as well that we’ve done this as it has since been reported that the Government itself has done precisely zero economic analysis of the impact of the tax cut and, as it turns out, our report is the only economically based submission which is against the tax cut (The RSPB have submitted an objection on the grounds of a very well founded environmental impact analysis). More than half of the other submissions and the bulk of those in favour of the cut are from companies and groups within the airport and airline industry. There is a great deal of concern that unless the government does pull its weight and do the maths itself then this policy could pass through simply on the say so of those who stand to benefit directly from the tax cut and at the expense of those who will lose out due to the impact on tourism and the lost revenue to public services. Preface and Key Points below the fold. It’s that time again. The annual Government Expenditure and Revenue Scotland report is out. Click the link or the image below to read it for yourself. Actually it seems like only March that the last edition was out. What’s happening here? Well, there was a consultation that almost no-one knew about which discussed a few methodological changes to GERS in line with the ‘new powers’ we’re getting and it also asked if the next report should be brought forward. I’m completely convinced that the fact that this means that we’re getting the report well before the Council election campaign next year is absolutely just a convenient side effect(! )…but no matter. We’ve got the data. Scotland’s budget deficit remains at a little under £15 billion. As with last year, don’t expect a single news outlet to go one single step further with the story than that. Except maybe to say that oil revenue has dropped from £1.802 billion last year to just £60 million this year. So what’s happened? Why hasn’t Scotland, which is “totally dependent on oil”, completely collapsed now that oil revenues have basically dropped to zero? Last year, total revenues dropped by around £500 million on 2013-14. This year, total revenues have INCREASED by £181 million. In fact, total revenue is higher than it was in 2012-13 when we received some £5.3 billion in oil revenue. It’s also worth noting that if you only look at GERS 2015-16 then it looks like our deficit has increased by a couple of hundred million in the past year but if you look a bit deeper, and compare the numbers to previous GERS reports then something interesting happens. In GERS 2014-15 our deficit was recorded as £14.8 billion but in GERS 2015-16 the 2014-15 deficit has somehow dropped by £622 million to £14.3 billion. Essentially, this shows one of the limits of GERS in that it is based on sometimes highly speculative estimates which get revised over time. It may be five years before we finally know the “true” accounts figures for this year. This accounting adjustment is extremely significant compared to, say, our “budget underspends” but unless you’ve read it here I expect it to pass entirely unnoticed. Now, what about our all hallowed GDP? It’s down by 0.45% from £157.502 billion in 2014-15 to £156.784 billion in 2015-16 (with non-oil GDP having increased by over £2.2 billion, the highest it’s ever been). You know, perhaps it’s time we started measuring our economy in terms other than just GDP. We know it’s flawed. We know it throws up extremely strange results like Ireland’s “economy” growing by 25% because a few American companies moved their nameplates around. We know it doesn’t even particularly correlate to things like tax and ability to service debt very well. Maybe it’s time we started measuring (and taxing) our country based on the things which actually matter. So what’s going on here? Essentially it’s the same pattern first picked up last year. As oil prices drop, so do fuel costs. Which means everything from the costs of transporting goods to the heating and lighting costs for your home drops. This means you have more money to spend in the economy and companies have fewer overheads leading to either greater profits (thus, ideally, more tax revenue) or more room to invest in expansion. This is a clear demonstration of the so-called “Dutch Disease” where high oil prices choke off the non-oil based economy in the form of the aforementioned fuel costs (it also tends to harden one’s currency but this is less of a factor in the Scottish case given that we don’t yet have one). At the time of the last report I was criticised for pointing this out on the grounds that the oil price collapse “hadn’t fully fed through” hence I was jumping the gun on the observation. It shall be interesting to see if anyone says the same thing now. Could revenues drop any lower? This should serve as somewhat of a warning to those itching for the return of high oil prices and certainly for those desperate to “replace” offshore oil with onshore fracking. It’s maybe time to have a good hard rethink about what kind of resources we want to develop in Scotland. Now, to be sure, I’ve nothing against our offshore industry and for those folk out there it’s been a pretty dreadful time. It’s just that, certainly as a Green, I think our offshore industry is on the wrong side of the country and should be based on wind/wave and tide rather than oil. You can be sure that if the wind and tide stops flowing we’ll be dealing with problems a little bit larger than the state of our finances. As mentioned earlier, part of the methodological changes discussed in the GERS consultation was to do with looking at the taxes to be devolved to Scotland under the series of “vast, new powers” we’ve been generously granted. In terms of actual revenue, chief amongst these is income tax (excluding interest and dividends, the ability to move the Personal Allowance or to adjust the definition of “income”) and VAT (excluding any actual control at all. We’re getting the VAT added to Scottish coffers and then an equivalent amount removed from the block grant. Yay.) along with comparatively minor taxes like landfill tax, aggregate levy and air passenger duty. In total, the Scottish government will directly receive 40.5% of Scottish revenue (£21.8 billion this year) and, given the limitations on VAT and income tax, have actual, practical control over perhaps half of that. Devolved expenditure, however, will soon sit at 63.1% of total (£43.3 billion). Basically the Scottish government can only directly control enough income to fund perhaps about a quarter of what it’s directly responsible for delivering. There’s a side issue in all of this related to that old topic of the budget underspends. Tucked away on page 47 of GERS there’s an interesting line which looks at the confidence intervals for some of the tax revenues used. Remember that the revenues given are estimates and are subject both to revision over time and change due to circumstances that the government cannot control. For example, if you move job half way through the tax year your income, therefore income tax, can change. If your job moves you to England, your entire income tax contribution moves from the Scotland side of the budget to the rUK one. Hence, the total income tax revenue estimate is subject to a margin of error, in this case of 1.0%. The same goes for other taxes to greater or lesser degree to the effect that the margin of error over all of the taxes measured there is 1.6% or ±£570 million. Remember that the Scottish Government has extremely limited borrowing powers. It can only “overspend” on the current budget by £200 million in a single year and cannot exceed a total current debt of £500 million. And yet income revenue, on which expenditure must be planned, has a margin of error of ±£570 million. In the event, this year Scotland’s “underspend” was only £150 million. If you think you can plan a budget better than this then please, send it in. If not, might be a good idea to stop reporting and moaning about underspends. Another little line that seems to have been added to GERS this year (on page 37) is a breakdown of the annual costs of financing Labour’s PFI and the SNP’s replacement NPD loans. There’s been a bit of a milestone reached there with the availability costs of PFI now exceeding £1 billion per year or over 15% of Scotland’s total capital budget and slated to increase even further over the next decade unless something is done about it. Don’t be surprised if this becomes a major issue for the council elections next year. Of course and once again you wouldn’t know this if all you did was watch our Great British Broadcaster, the BBC. Their recent “investigation” into PFI couldn’t even bring itself to mention the name of the party which lumped this crippling financial burden on us. I could go on. We could nip-pick at details like the mysterious addition to the expenditure budget of net EU contributions (there’s always been an annex discussing this but this is first year it has explicitly been counted in a separate line in Total Expenditure) or notice that for the first time in at least five years our debt interest paid has increased as our UK debt increases have started to outweigh the effect of falling bond yields. It’s all a shell game though. We know that GERS isn’t nearly as important as people hold it to be nor is it nearly as informative as it should be. It’s not going to change many minds on its own nor does it tell us one single thing about the finances of an independent Scotland. If we want to do that, we’re going to need to build a national budget from scratch, taking into account all of the taxes (existing and new) that an independent Scotland might choose to levy. We also need to have a look again at what Scotland actually needs to spend its money on. Could we use Citizen’s Income to create from scratch a welfare system worthy of the name? Would a Scottish Government able to issue its own bonds on its own debt be able to get a better deal than the one we have right now? Quite simply can Scotland as a nation see ourselves as better than others would prefer us to be seen?